WASHINGTON, DC -- Russian-backed separatists are planning a fresh offensive in eastern Ukraine that could come within a matter of months, warns retired General Wesley Clark, a former NATO Supreme Allied Commander. 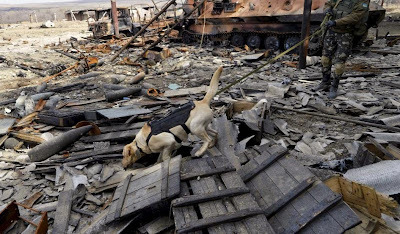 A Ukrainian serviceman with a dog takes part in a search operation to deactivate and destruct ammunition in the settlement of Luhansk, Donetsk region, March 27, 2015. “What is happening now is preparations for a renewed offensive from the east,” and this could take place following Orthodox Easter, on April 12, and “most probably” before VE Day on May 8, Clark said on March 30, citing multiple local sources he spoke with on a recent fact-finding mission to Ukraine. These two actions would fall within the parameters of the administration’s current policy not to provide lethal assistance to Ukraine. “In the event you can’t change [U.S. policy], at least you can have a package and promise it, promote it, explain it and use it in deterrence … The fact that the United States is coming to the rescue would go like a shot of adrenalin from top to bottom of the Ukrainian armed forces,” said Clark. “At every level, people are very conscious of the fact that they are fighting what they consider the battle for Western civilization,” he added. Clark briefed an audience at the Atlantic Council on the findings of his mid-March visit to Ukraine. He traveled with retired Lt. Gen. Patrick M. Hughes, former director of the Defense Intelligence Agency, and retired Lt. Gen. John S. Caldwell, former Army research, development and acquisition chief. The Atlantic Council and Open Society Foundations sponsored the trip. Any counter-unmanned aerial vehicle systems that can be made available on a near-term basis. The urgency here is driven by the pending Russian spring offensive. At the minimum, a palletized, emergency assistance package consisting of as many lethal components as possible should be assembled and pre-deployed for strategic airlift upon commencement of the Russian offensive. A report produced in February by the Atlantic Council, the Brookings Institution, and the Chicago Council on Global Affairs urged the United States to give Ukraine defensive weapons and $3 billion in military aid over three years in a bid to deter Russian aggression in Eastern Europe. Clark supported the call to provide defensive weapons, adding that Ukraine’s military has fought frontline Russian forces, separatists and high-technology weapons and drones that even U.S. forces have not had to face. Jan Lodal, one of the authors of that report and a Distinguished Fellow and former president of the Atlantic Council, moderated the March 30 discussion with Clark. Military equipment being shipped over Russian border Russia and Ukraine agreed to the so-called Minsk II ceasefire in February. 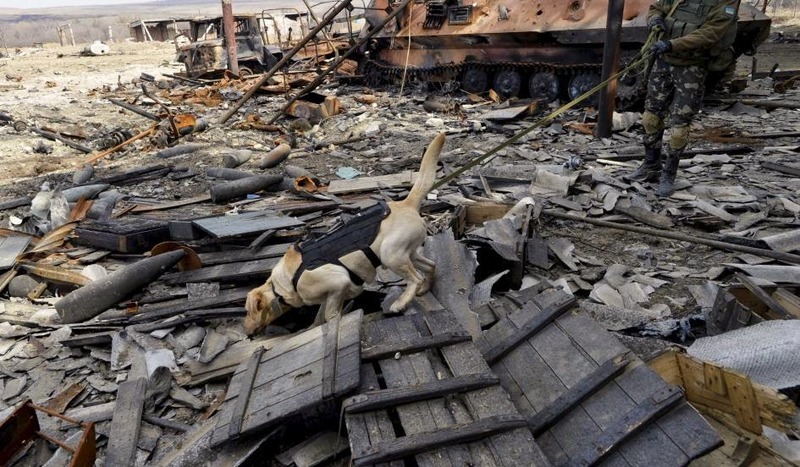 The previous Minsk agreement collapsed within days of its September 5, 2014, signing in Belarus’ capital. Additional military supplies and equipment were being brought into Ukraine from across an open border with Russia, he added. Under Minsk II, the Organization for Security and Cooperation in Europe (OSCE) is to verify the withdrawal of heavy weapons. However, the OSCE is handicapped by the fact that it has only a couple of observation points, and that Russian military personnel make up more than half of its monitoring missions, said Clark. On these missions, Russian military personnel are free to check out Ukrainian positions and are bound by an “honor code” not to relay this information to Russian forces. “OSCE is essentially non-functioning,” said Clark, who led Operation Allied Force in the Kosovo War during his term as NATO’s Supreme Allied Commander Europe from 1997 to 2000. Moscow’s goal in Ukraine is to bring its eastern neighbor back into Russia’s orbit, said Clark. As part of that effort, Russia’s war plan has four phases: terrorism, irregular forces, Russian peacekeeping forces and a de-escalatory phase. He said Russian special forces known as Spetsnaz had occupied buildings during operations in the eastern Ukrainian cities of Donetsk and Luhansk. He described Putin as the “military commander” of Russia’s actions in Ukraine, but cautioned against simply focusing on the Russian leader’s objectives as purely being military or geographical. “[Putin’s] objective in this would be much broader than Ukraine. It would be to shatter the sense of well-being and confidence among the nations of Eastern Europe in NATO protection and, ideally, to drive a permanent wedge between the United States and its European allies, and the Western allies and Eastern Europe,” he added. “You need a balanced approach,” he explained. Is it going according to American's goal? Certainly not to Putin's goal!